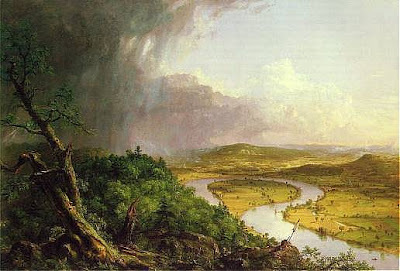 Massachusetts, after a Thunderstorm (The Oxbow)" (1836). I had breakfast with friends at a café beside the river, and then rode my bike to school on busy Route 1. It’s a slightly scary trip, I must admit, but also (perhaps for that reason) quite exhilarating It’s somehow a thrill to know that I’m a few feet (or inches) from sudden death as the cars dash past me at 50 mph. It’s a bit terrifying, but strangely heady, as well. Today I introduced “silent free reading”. The students came to class with a book they had chosen, and we began with about 10 minutes of silent reading. (We’ll do this three days a week.) I read, too, sitting at the round table with my students, each of us taking a break from the helter-skelter of a typical school day and just enjoying a few minutes with a book. It’s going to be – I can tell – a precious time in English class this year. We’ll all look forward to these restful breaks – a chance to drop out of the race and read for pure delight. One of my favorite times of each day is the end of a class, when the students and I thank each other. I introduce this idea to the kids at the beginning of each year, and they fall into the habit fairly quickly. I tell them we both deserve thanks and congratulations at the end of a class because being an attentive English student for 48 minutes is hard work, and so is being an English teacher. So, as they leave my classroom, I stand at the door and thank each of them by name, and they do the same for me. It’s an extraordinary moment in my day, and I have four of them each day of the school year. Lucky me. After school: happy hour with colleagues on the deck of a tavern with a beautiful view of the sea, then dinner with some friends in a favorite cafe, then a bike ride home in the evening light with the crimson setting sun in my rear-view mirror.